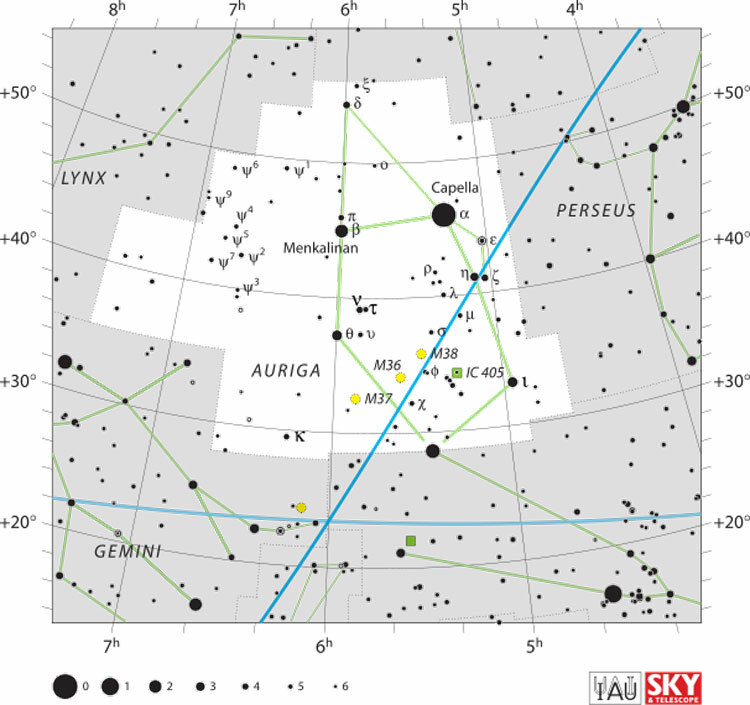 Epsilon (ε) Aurigae (see map at bottom) is an eclipsing variable with a very unusual light curve. For the best part of 27 years the star remains at normal brightness (about 3rd apparent magnitude, but with an absolute magnitude of minus 6.5, given the approximately 800 parsecs or 2600 light years between the system and the Sun). It then undergoes a two year long decline in brightness, indicating that the object partially eclipsing it must take the best part of two years to pass in front of it. At one time it was thought that must mean that the unseen companion was as big as the orbit of Jupiter, but in recent years it has been realized that the companion isn't nearly that large. Instead, the star is surrounded by a thick dusty disk, which is the primary cause of the obscuration. Although the dust in the disk is relatively cool it absorbs heat from the star it surrounds, and reradiates it as infrared radiation. This makes the Spitzer Space Telescope, which is capable of studying long wavelength infrared radiation, a perfect candidate for unraveling the mystery of this star. And that appears to be exactly what it has done, when epsilon Aurigae started into its most recent eclipse. As shown below the light curve of the combined system can be represented by a very bright "F-type" star (a two solar mass yellow giant with a surface temperature of about 8,000 Kelvins, about 300 times the radius of the Sun, and a luminosity about 40,000 times that of the Sun), a relatively bright "B-type" main-sequence star (about 6 solar masses with a surface temperature of about 20,000 Kelvins, about 3 times the size and 400 times the brightness of the Sun, but considerably obscured by the dusty disk surrounding it), and the infrared radiation from the disk itself. The disk is now estimated to be about 8 AUs (approximately 750 million miles) in diameter, or about 20% of the size of the 18 AU semi-major axis of the stars' orbits. Although the recent observations seem to have solved the question of what the system is like, there are still questions to be answered. Two solar mass stars have lifetimes of around two billion years, while six solar mass stars only last a few hundred million years; but the two stars must be about the same age, so there is no way that the more massive star can still be a main sequence star and the less massive star can be dying (having swelled up to become a "red" giant), unless there was a substantial transfer of mass between them at some point in the recent past (see Mass Transfer In Binary Star Systems). But given the large distance between the stars, it seems unlikely that much of the mass lost by the more massive star could have ended up in the less massive star. 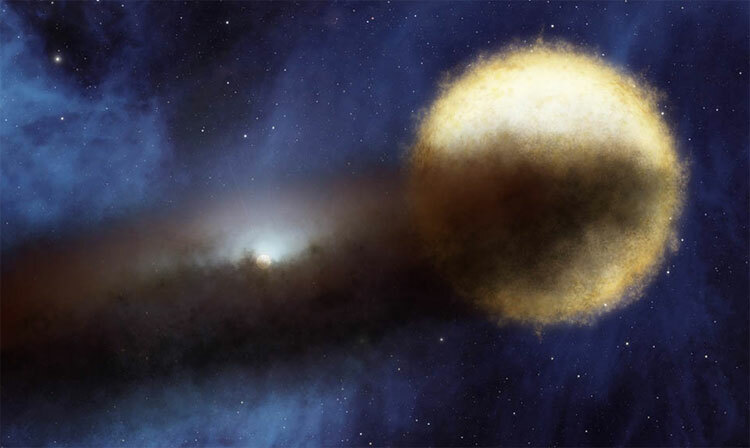 The dusty disk is also a puzzle, both in terms of its huge size and the size of its dust grains, which must be -- based on the way they affect light passing through the disk -- sand grain or gravel sized, instead of the usual microscopic size of dusty particles in space. Fortunately, with the star in eclipse for the rest of 2010 and a good part of 2011, this is an ideal time to make the observations needed to answer these questions, and at the time of this update (December 2015), the mystery may have already been solved (and if so, the next update of this page will include the results of the latest observations). 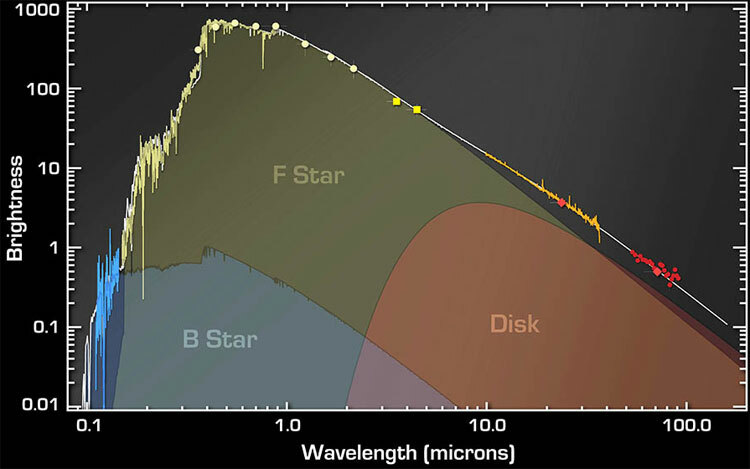 The spectrum of epsilon Aurigae and its probable source(s). An artist's representation of the binary star in eclipse.